Excellence in Academic Advising (EAA) establishes aspirational standards for institutions to evaluate and improve academic advising, acknowledge the central role of advising in promoting student learning, success and completion. In the first year, FSU will partner with an EAA fellow, who will guide the University through an institution-wide, evidence‐based decision-making, planning and implementation process to improve its academic advising efforts. Using EAA’s nine “Conditions of Excellence in Academic Advising,” FSU will refine, validate and establish the standards or benchmarks to guide a reflective self-study and strategic assessment of academic advising. FSU faculty and staff have already spent the past year studying the University’s advising processes, identifying strengths and areas for change. FSU’s retention of first-year students to the sophomore year increased by 3.4 percent between 2017 and 2018, a possible benefit of the work that has been done so far. In addition to FSU, 11 other institutions from across the country were selected from a large pool of applicants with various advising structures. This charter cohort represents a range of 2- and 4-year institutions, including small liberal-arts colleges, Historically Black Colleges and Universities, large, online, 4-year regional and state institutions, as well as both online and on-campus institutions. The other institutions are College of the Mainland, Wiregrass Georgia Technical College, State University of New York at New Paltz (SUNY-New Paltz), Florida International University, American Public University System, University of Wisconsin-Eau Claire, University of Hawai’i-Mānoa, University of Southern Maine, Johns Hopkins University, Claflin University and Wheaton College Massachusetts. The effort is being led by task force co-chairs Dr. Ben Norris, chair of the faculty and an associate professor of chemistry, and Dr. Jay Hegeman, associate vice president for Student Success and registrar. 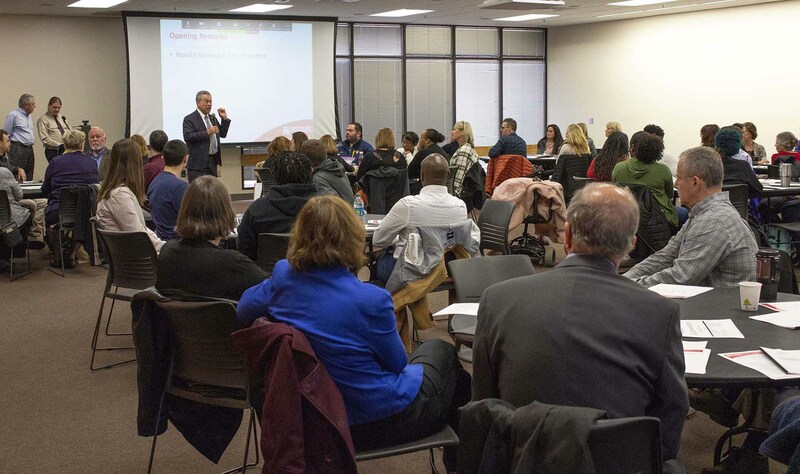 Frostburg State University President Ronald Nowaczyk speaks to the launch meeting of the Excellence in Academic Advising project task force, a broad-ranging group of faculty, staff and students. FSU is one of only 12 institutions in the nation to participate in this program.